呼虹宇, 景治涛, 王运杰. 显微手术治疗侧脑室肿瘤78例临床分析[J]. 中国医科大学学报, 2018, 47(11): 964-968. HU Hongyu, JING Zhitao, WANG Yunjie. Microsurgical Treatment of Lateral Ventricle Tumors: Clinical Analysis of 78 Cases[J]. Journal of China Medical University, 2018, 47(11): 964-968. Abstract: Objective To describe the surgical approaches for different types of lateral ventricle tumors and the risk factors related to postoperative recovery. Methods We included 78 patients who visited the neurosurgery department in the First Hospital of China Medical University. 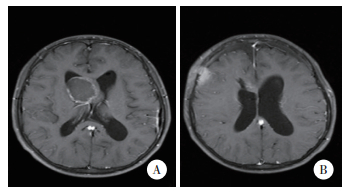 Lateral ventricle tumors were detected radiologically and microsurgical treatment was performed between 2011 to 2016. Results Among the enrolled patients, 81.3% had intracranial hypertension, 9.5% patients had a movement disorder, 5.8% had a visual field disorder, 3.4% had epilepsy, and 4.6% patients had no obvious clinical symptoms. There were 34 benign tumors and 44 malignant tumors. Eight cases underwent partial resection and one case underwent a biopsy. All 78 patients were followed up for 6 to 45 months. The prognosis was evaluated by postoperative GOS scores. We observed 54 patients with 5 points, 16 with 4 points, 3 with 3 points, 3 with 2 points, and 2 with 1 point each. Conclusion The location of the lateral ventricle is deep and close to many important functional areas. Therefore, surgeries are difficult. The choice of a surgical approach should be based on the tumor location to reduce postoperative complications. Males, elderly patients, the extent of the malignancy, and larger tumors are related to prognosis. 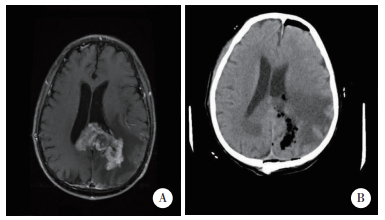 DANAILA L. Primary tumors of the lateral ventricles of the brain[J]. Chirurgia (Bucur), 2013, 108(5): 616-630.